Delicate vanilla cake dotted with real vanilla bean. Glossy chocolate ganache messing up your fingers. It’s the simple things in life! This is basically the Vegan Cupcakes Take Over The World cupcakes, only made a teeny bit more awesome. Preheat oven to 350 F. Line muffin pan with cupcake liners. Spray lightly with cooking spray. In a small sauce pan, bring the milk to a boil and then lower the heat to a simmer and add the chocolate and syrup. Mix with a rubber spatula for about 30 seconds. Turn heat off, continue stirring until the chocolate is fully melted and the icing is smooth. Let ganache cool for about 10 minutes. 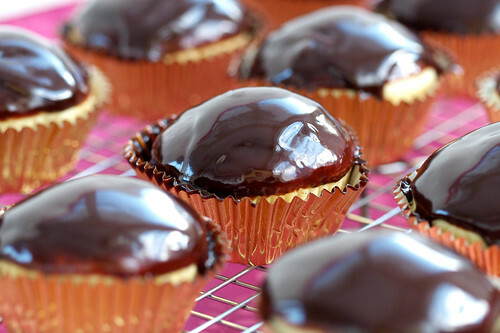 Dip the top of the cupcake in the ganache and then set them on a cooling rack. Spoon the remainder of the ganache over cupcakes. Let set in a cool room for an hour or so, or place in the fridge to set. Serve to happy people! seriously…omnomonom. i cant wait til i get home for thanksgiving break so i can test these out! thank you for being awesome. these are TO. DIE. FOR!! Do you mean Vegan Cupcakes take over the World cupcakes? Not VCIYCJ? Anyway, they look amazing. I love seeing the little bits of vanilla. I was wondering: I've been using Oat milk and cream in my cupcakes lately, Have you tried it? So fancy, they look gorgeous! These cupcakes look absolutely mouth-watering! Do you think 1 tsp of vanilla bean paste could be subbed in for the vanilla bean? These look so light and delicious….and that ganache! LOVE. I have a reel ‘hate-on’ for cornstarch; can I assume that arrowroot can replace that in equal amounts? Thanks! OOh cool beans! Definitely worth a bite! Can anyone tell me; a half-cup of choc chips equals how many ounces (can get choc here but not chips)? Thanks! by weight, i mean, not volume. thnx. for this and for future reference. I would say that those are absolutely perfect. Vanilla beans are the best in those cupcakes. I’ve been working my way through a windfall of beans and all my vanilla cupcakes are now vanilla BEAN. And to Laura in Taos – I’ve used arrowroot in them and they turn out fine. Does it have to be maple syrup? Will agave work? Would this work as a sheet cake too? These are gorgeous! The texture looks just right and with such a very fine crumb. The cupcakes turned out great but the ganache was a total fail for me :(. It was all runny and wouldn’t set, wouldn’t even adhere to the cupcake when dipped in the ganache (after letting both cool). Will definitely do the cakes again, with a chocolate frosting. I made these for dessert tonight, and my friend had three! So good! all my omnivore friends LOVED these. sign of success! I love the ganache cupcakes. It always make my mouth watering and eat almost all of the ganache my mother’s used to bake when I was a kid. I think I should bake some for my kids too. I have to update my original post. The ganache had been a fail for me the first time, but this time it worked wonderfully. Deelish! Can I make this into a cake without changing anything? @ Allie, yes you can. I’ve used this recipe for cake, you might have to up the frosting though. I’m pretty new to baking and multi-step receipts and thus not very good with figuring out substitutions. I’m allergic to almonds. Would it be better to substitute soy milk or coconut milk (or some other type of non-dairy milk) for almond milk? Soy milk will work just fine! Will rice milk work instead of almond milk ? Served these at a party to my omnivore friends who LOVED them. They disappeared from the plate. The ganache frosting is very easy, perfect if you’re busy and don’t have time to fool with making a traditional frosting. I made these last week, and they were delicious! I brought them to my lab meeting and everyone loved them, including the omins, not that I doubted it as any cupcakes from VCTOW have always been a huge hit, I’m always being asked for the recipe. Made these over the weekend. To be honest this was my first recipe from this site that I really found disappointing. The cake was bland and seemed heavy and oily. I don’t know if this happened to anyone else, but I followed all the directions to a T.
semisweet chocolate chips are just made from cacao tree. no milk. too much cornstarch? my cupcakes turned out really dense, and i was expecting a light, fluffy cake so i was disappointed. The flavor was amazing though, and it pairs really nice with the ganache (which i used agave instead of maple syrup and it was great). Actually, most semi-sweet chocolate chips (and most chocolate in general) test positive for dairy, as does most soy milk (curse you FDA!!). Why? Trace amounts are added, or the manufacturer uses ingredients purchased from other vendors that have trace amounts, or “additives” like calcium proprionate, calcium lactase or lactylate, and caseine or caseinate, etc. etc. etc. are all derived from dairy. Sad but true. I’m not 100% vegan (more like 95%), but I am 100% dairy intolerant so I have to pay extra special attention to this stuff, and tend to get foods tested a lot. You’d be surprised at the ingredients that are dairy derived. And also at how many things that the FDA deems “dairy free” have dairy in them. AND suprised at the number of things that shouldn’t have dairy in them but test positive for dairy anyway. Wow! Dee-lish! “ganache” making is not a gift i am blessed to have, but it all came out sooooo verrrrry gooooood! I might not share the left-overs! I am sooo making these for my son’s birthday tomorrow! looks YUMMY! lol! Vanilla beans are fairly inexpensive if you buy them on ebay. I just got 30 for about $10 with shipping on there. Don’t let those fancy food store prices stop you! Also, the reason vanilla beans are so expensive is because they take FOREVER to grow and the plants are really sensitive. I visited a spice farm in India and the guy couldn’t even touch the bean pod and we had to stand 5 feet back to make sure we did not hurt the vine. Crazy! My cupcakes tend to stick to the paper, does this happen to anyone else? Any ideas on fixing that? Also @raena, I was looking around because EnerG egg replacer has calcium lactate in it and it looks like calcium lactate can be vegan or non vegan. And in commercially produced products is usually vegan. The Lactate part doesn’t mean that it’s from milk, it’s referring to lactic acid added to the calcium. Spray the liner with non-stick cooking spray. Will this taste just as good with soymilk? @raena try to find Enjoy Life chocolate chips. They’re dairy-free (top 8 allergen free actually). I have a ton of food allergies and those babies are great to use! Liz, I used the recipe for a cake (doubled all the ingredients) and kept it in the oven for an hour at 350 F. It turned out well! I made a layer cake out of the recipe using the ganache as both a filling and a topping, everyone said it was so moist and did not taste like it was any different than a traditional cake (with all the eggs and butter). I made two layers by doubling the recipe and it held up very well (and the fact that it is probably healthier than a cake with butter and eggs doesn’t hurt). I would just do an all purpose gluten free baking mix (that is corn-free) and use tapioca instead of cornstarch. And what a good friend you are! Anyway, thank you for the recipe! I recently bought Vegan Cupcakes take over the World, and I am having a lot of fun baking them! These cupcakes are delicious! I am not sure what happened but my ganache came out runny with a more water-like consistency that didn’t really stick. Did anyone else have this problem, and if so what did you do to fix it? Perhaps just let it cool for a bit, but not so much that it entirely sets. Made these tonight on a whim for a newly-vegan friend. Having been vegan or vegetarian for most of my life, I’ve done a ton of vegan baking over the years. I’d never had great results with a cake or cupcakes so was worried going in. I had to make them last minute and was even more worried about the ganache setting correctly. Needless to say, they came together in less than 10 minutes. I baked most of the batter in an 8″ round pan (didn’t rise much) and made a few cupcakes with the leftovers. The ganache also came together quickly and set up nicely in the fridge after about an hour. All in all, this was a tasty combo. The vanilla flavor is quite strong but is balanced well with the not-too-sweet chocolate. The texture was TERRIFIC. Super soft, moist, and slightly chewy–which was actually great for such a thin cake. The cupcakes were exceptionally moist. Total baking time for the 8″ round was about 20 minutes. The cupcakes came out in 15. Rave reviews from my tasters–mostly they asked how a vegan cake could be so moist. Next time I’m thinking of tweaking the vanilla flavoring and maybe doing a layer cake with raspberry/strawberry jam between layers. Thanks for the great recipe! My finished cake looked like it came out of a magazine and was so insanely easy to make. I am new to baking and this recipe was easy to follow. I made the almond milk using a Vitamix and 1/4 cup almonds, 2/3 cup water. I chilled the ganache for about 1.5 hours in a glass Pyrex container and frosted the cupcakes before serving. This was a definite hit with my husband (former chef @ the Vegan; Maui). I am eager to try this recipe for a layer cake with raspberry in the center. I subbed agave for the sugar – instead of 3/4 cup white sugar, I used 1/2 cup of agave nectar – and had great results. 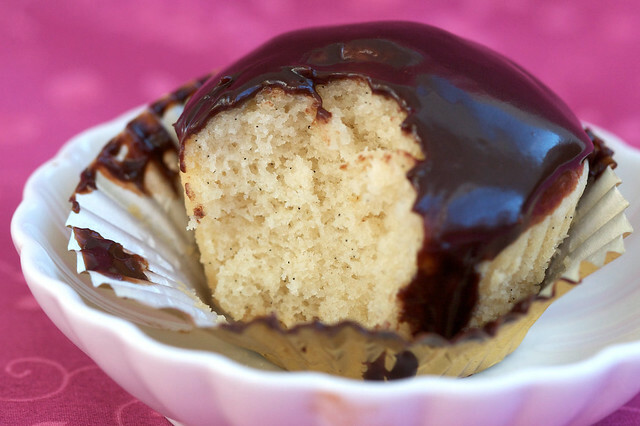 Moist, tender and not too dense of a cupcake and a seriously yummy chocolate ganache topping! Can I sub arrowroot, kuzu, or tapioca for the cornstarch? Oh wait, I see the previous comment about this…nevermind! Could you share your buttercream (coconut oil) recipe?? I’m new to vegan baking and have no clue how to make it. I just made these for my family. We are eating more veg and my friends are vegan, so I decided to try this recipe out. AMAZING, unfortunately I didn’t have vanilla beans, but whatever. I had Guittard dark chocolate, almond milk and all the other ingredients. My hubby and children giggled with glee over the taste of these. I look forward to making these often, they are superb. Next time I’m following another post above and ordering vanilla beans from eBay. 5 stars! Something really weird just happened – followed the recipe exactly aside from replacing cornstarch with arrowroot powder – the batter tasted great but the cakes themselves were AWFUL. I really have no idea what happened…! Hope you don’t mind but I made these to take to a party and then blogged about how wonderful these little treats are for any day. You can find it at http://genkikitty.wordpress.com/2011/11/17/vanilla-bean-cupcakes-with-chocolate-ganache-review-recipe/. I did put a link to this page since I was talking about your recipe. Thanks again for the awesome cupcakes! Yum! How many cupcakes does this recipe make? I am so going to make these for my birthday in 3 weeks, and I’d love for all of my visiting extended family to appreciate the veganness, but I need to know if I should increase the amounts or not. I am very excited to make these! 1 dozen. Says so right up there! Haha I’m a ditz! Thanks very much. These are to die for! I have your Cupcakes cookbook and love it!!! Every single cupcake has been a success, especially with my non-vegan friends and family. I usually replace the soy/almond milk with coconut milk so my sister can be my taste tester – she has a nut allergy. Quick question – where do you find chocolate extract? Alright, old vegetarian, very new to veganism. This was my first shot at vegan baking and I’m really wondering if I’m using the wrong almond milk? The kind used didn’t curdle with the vinegar, even after 10 minutes, and the ganache never set, even after a last ditch effort in the fridge. Is there a particular brand I should look out for? I’d really really love to master this recipe. Yep, many (if not most) semi-sweet, bittersweet and dark chocolate chips are vegan. Just check the package to be sure! How thick do you recommend the cupcake batter should generally be for any of your cupcakes? I swear this is my go to ganache. Tonight I plan on layering it over a strawberry caramel tart, with more caramel sauce drizzled on top of course! Thank you Isa! I am making these for my birthday party on Saturday, and I have made 3 test batches, had friends make batches, and gosh darn it, they’re just the teensiest bit off. They look fine when they come out of the oven, they taste AWESOME, but they always end up noticeably gummy in the middle. I think they sink after coming out of the oven. I’ve gone through the usual suspects, I don’t overmix, I’ve tried batches with all-purpose and some with baking flour, I measure very precisely, I don’t open the oven, the oven’s the right temperature, the raising agents are brand new. Have you, Isa, (or any of you out there!!) weighed your flour for this recipe? I’ve noticed sometimes that Veganomicon/PPK recipes are a little thinner for me and turn out fine when I add a little extra flour– is it possible I just measure my flour really light? Would adding a little extra flour solve this slight gumminess problem or make it worse? I can tell these cupcakes should be AMAZING but they’re just not quite right and I don’t know how to fix them. I have a bunch of omnivores coming over and I want to prove to them without a shadow of a doubt that vegan cupcakes taste AWESOME. Please help!!! If they’re gummy in the center is it possible they’re underbaked? Thank you! Umm… I don’t think so? A toothpick comes out clean and they’re quite golden around the edges… I tried 20 minutes for one batch and 22 minutes for another. Should I try leaving them in another 2-3 minutes? OK– so 4th/5th batch was a charm! I think I learned something that may be helpful to others… I made the chocolate cupcake recipe and the vanilla cupcake recipe at the same time, and happened to notice that the vanilla batter (made with the almond milk) was noticeably thinner than the chocolate batter (made with the soy milk). It may be that my almond milk brand is particularly thin, but the good news was that I added 2 Tbsp. of flour to make the consistencies match and the results were PERFECT! Thanks for such great recipes, Isa– I’m sure people say this to you all the time, but I honestly don’t think my boyfriend and I could have sustained our veganism if it weren’t for your recipes. We’re so proud to share our food, and we love to eat it! Wow, good for you for motoring through your problems! And yeah, when flour isn’t weighed, some tinkering is sometimes necessary. I’d also love to know if/how this would work as a layer cake. Thanks! It’s time for me to leave a comment as well. I totally adore these cupcakes. I make them with whole spelt flour and 2/3 whole sugar, which makes tem a bit darker bit the vanilla pairs up the the caramelly flavour of the sugar extremely well. Wonderfull consistency, fluffy, moist, to die for. Thanks! Thank you for this great recipe! I’m going to make them for my daughter’s slumber party. She has so many friends with food allergies that I can have any store bought foods at her party. I’m replacing the almond milk with soy milk. 3 kids with nut allergies! Can I substitute applesauce for the oil? My dad is on the RAVE diet which doesn’t allow any oil. Trying to find a way to make him a cake for his birthday. Any help would be appreciated. Sure, but it will be more muffiny. If he is allowed nut butters, replace half with cashew or almond butter and the rest with applesauce, or some ratio thereof. I doubled this recipe and cooked it in a 8″ spring form pan lined with parchment paper. It took about 40 minutes to cook through. I put an open can of coconut milk in the fridge overnight, scooped out the fat from the top, and mixed it with cocoa powder, powdered sugar, and vanilla and almond extract to make a frosting for the cake. It was super moist and yummy, and I will absolutely make this again! Thank you for this recipe, they are delicious and moist! My ganache turned out with little bumps in it, what causes this? I’d like to get it right next time. Thanks! Hmm. Bumps. Was it possible there was something in the pan that you didn’t notice? Or in the bag of chips? That happens to me with stuff every now and again. It doesn’t sound like the chocolate seized because that would be much worse than little bumps. Ooh, I hope it was just a weird something-or-other like that. It just never got smooth, though it tasted great…evidently I am destined to try again very soon. Thank you! Ohh, these look yummy! Would I be able to substitute the flour, for something a little healthier like wholewheat pastry or something else? If so, would I use the same amount & would I still use cornstarch? I’m not sure I’ll be able to find a vanilla bean before I want to bake these, would the recipe really be off if I didn’t use one? Thanks in advance for your advice! I made these for my birthday for my first attempt at vegan baking and they were fantastic! Who knew it was that easy?! Followed the recipe exactly and was thrilled with the results. Only one thing which I’m sure was user-error, was that my ganache was a bit runnier than I thought it should be, but still delicious. I loved the pretty vanilla bean specks. Thank you for the recipe! These were really good but I realized too late that the ganache is NOT vegan as semi-sweet chocolate chips have milk in them. These are OMG! delicious! As most recipes I’ve tried from Isa. Love the muffin and cookie cookbooks; I’m going to buy the pie cookbook next. These look scrumptious! Can’t wait to taste them. Gonna make them today! Love the chocolate ganache. That’s probably the most tasty part. I love this chocolate ganache! This and the macadamian nut frosting with the strawberry shortcakes (scones) in Vegan with a Vengeance have frosted every cake I know! Amazing. Best cupcakes ever. I topped them with a vanilla buttercream frosting, though. I have made these twice – both times the cupcakes came out AMAZING but the 2nd time the ganache just didn’t set right and was thin and not really pretty or super tasty. Also, the 1st time I got 14 cupcakes and not 12, 2nd time 10 cupcakes and not 12. Weird, eh? Once I got to mixing stuff I realized I was out of apple cider vinegar and I don’t drive so I couldn’t run and get some so I just sorta used white vinegar tho I know it had chances of messing with the recipe. and that it did! They didn’t get to fluffy they did raise just not fluffy like I’m use to and they were a tad heavy. so make sure you have all the correct ingredients! I also couldn’t find any vanilla bean go figure the time I need one they are nowhere to be found in the store, so I added a tad of cinnamon. I also do not have any pam or spray stuff so the cupcakes did stick to the wrapper! I typically don’t like anything can spray like that food related but next time I make these I suppose I’ll pick some up. Over all they did taste good not as fluffy as I’d like, I have made vegan cupcakes in the past but used apple sauce. My chocolate ganache did have a few tiny chunks like someone else mentioned but not many for it to effect anything it came out good. So just my input tasty but make sure you have ALL of the correct ingredients! I also like how it doesn’t make a huge amount so i’m not stuck being the one finishing them all off like typical with deserts in my house lol. not cause they don’t like ti just because they prefer candy. i think this recipe has potential but i was honestly a little disappointed with the flavor. maybe it needed more vanilla bean, i used a whole madagascar one but still didnt get that wow vanilla taste. next time ill have to tweak it a bit to get it past the plain vanilla white cake i ended up with. i have to say though, my friends i served this to really liked it. but im really picky with vanilla cake and am trying to find a recipe to break my prejudice. thank you for the inspiration though! I made these this weekend and they were a big hit at a party (I topped them each with a raspberry for extra pretty). But for the ganache I had to use 2/3 cup of choc chips t get a consistency that was soft but set. This is a delicious cupcake recipe. It’s my about fav, go-to for cupcakes. However everytime I’ve made the ganache, the chocolate seizes up on me when I add almond milk. I usually just add a touch of coconut oil instead, but was wondering if it’s something I’m doing and can avoid doing in the future. I made these yesterday and all I can say is OH MY!!!! I don’t know what it is about these cupcakes but they taste/look nostalgic to me. Like the other readers, I had minor issues with the ganache but regardless it worked out and it still tasted great. The cake itself wasn’t too intense of a vanilla (I used a high quality vanilla bean) but it was just right for this dessert. I can totally see this cupcake as having a berry topping or icing (sans ganache)….The possibilities are endless! I also like the idea of using it as a layer cake too. Thank you for the inspiration!!! I made these with white whole wheat flour and a tad less sugar and they were great… thanks for the recipe. They were a win with the hubs! This recipe looks incredible! I was wondering if it’s possible to use this recipe to make a cake instead? I’m thinking the cooking time might be different but would that be all? Thanks so much! Just wondering if the cupcakes can be frozen and the ganache added after defrosting? I’ve tried this recipe just a few days ago, I changed it up a little bit, well actually just the decoration because they were Easter cupcakes. Here’s my recipe, hope you like how my cupcakes came out Isa! All twelve of these cupcakes were seriously scarfed in less than ten minutes. My non-vegan husband LOVED them. These were delicious! I made them for my vegan husband’s birthday. Omnis loved them too! I made the cupcakes exactly as directed. I doubled the recipe and made 24 cupcakes. No issues or problems. The batter is tasty – reminds me of cookie dough. The cake is dense and so moist. For the ganache I added a tablespoon of vegan butter (most ganache recipes have a fat component. I also added additional chips. I topped the some of the cupcakes with vegan marzipan. Others I topped with vegan bacon (made with coconut flakes). Both toppings were excellent with this recipe. This one is a keeper! Isa do you think I could double this recipe to make a 14×14 cake? Do you think it’s too delicate to layer & use fondant? I made these for my niece’s birthday party yesterday. They were a big hit! Thank you — we hadn’t found a good vegan yellow cake recipe yet! This will be our go-to now. Note: The batter seemed thin but it cooked beautifully. 18 mins was all it needed. We didn’t have a vanilla bean. Just did 2 tsp van extract. I used store bought frosting. I’m usually pretty good about reading recipe reviews and altering if need be, but failed this time around. Recipe for the cake is absolutely perfect and divine! The ganache was super runny, as others have said- after having the first batch completely run off like water I remade it and let it sit for about an hour and added a bit more chocolate chips to help thicken it up. They look far from pretty, but damn are they yummy! If I make this with apple sauce instead of oil and with maple syrup instead of sugar, do you think it will still turn out? How much, do you think I would need to decrease the wet ingredients by? If I use coconut oil instead of the canola would I just use the same amount? want to make this for my daughters first birthday on saturday (so she can indulge and I wont feel guilty)… hope to hear from you. Green Tea-ramisu Bliss! | Hello Vegan! I was keen on baking the cupcakes. Just wanted to know if I could substitute almond / soy milk with regular milk? Cornstarch isn’t available where I live, please suggest replacement for it. Options is Corn flour/ arrow root. What in this recipe is the substitute for eggs? Or is the cornstarch the binding agent? I am new to vegan baking, and have a wedding that I am doing in August. Any suggestions would be so helpful! Thank you! I hope you don’t mind, you’ve got a fans in New Zealand! Going to trial this as a cake! Planning a DIY wedding, in which my (non-vegan) aunt is making our wedding cake! I think this would be a great wedding cake base recipe. Thank you, Isa, for this delicious recipe. I made a test run today in anticipation of a friend’s birthday next week. They were moist and bursting with vanilla flavor. The chocolate ganache was luscious. We used fresh raspberries to finish off what was left in an impromptu fondue. These cupcakes are a winner, delicious and moist. I made some non-vegan cupcakes as well and i have to say the cake part of this was wayyy better since the other turned out dry. A good lighter, dessert. I’ve made this recipe few times (in a 8” inch mold or cupcakes) and I can’t get it right! It’s always to dense, to humid. It’s not that it’s not good, it’s juste not fluffy, more like a Quatre-Quart. I’ve tried most of the recipies on VCTOW without any problem but I can get a basic white cake right. Just want to say I made these without testing the recipe first. That is how confident I am that your recipes are always amazing. I made these for my 55th b-day! One batch I left out baking soda accidently but the end result was still amazing. The batch with soda was fluffier (duh) but the batch without was a little thicker or heavier cake but the flavor with each was perfect. Delicious. When tested side by side, people tended to like the heavier non-baking soda a tad better. It was just a consistency thing and just wanted to FYI. The cupcakes were delicate and delicious–just like me LOL. I need to make a soy-free, nut-free vegan cupcake. Will these work with coconut or rice milk? Possibly the best cup cake we ever eaten. Thank you for the recipe. Hello. I have your cupcake book and make many of the recipes. LOVE them! Do you have a recipe for vanilla cake that can be increased for a large cake pan – 12 to 14 inches? Will this recipe hold up to doubling and baking in that size? Thank you!!! Thank you so much for that lovely recipe as it is a favorite in our household. Does anyone have any suggestions/techniques for splitting and scraping a vanilla bean? Could this batter be frozen before baking? We actually used this recipe for our wedding cake we loved it so much!